Wednesday afternoon I had a reunion with a friend after haven't having had seen her in four years! It was so wonderful to catch up and I was thrilled to find out that even though I hate to drive, her beautiful home in Stow, Massachusetts is a beautiful half-hour drive away on Route 117. 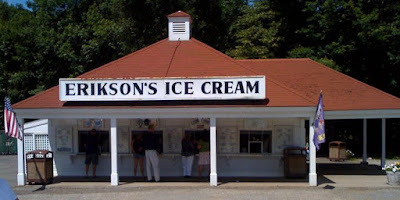 The cherry on top is that also on Route 117 is Maynard's Erikson's Ice Cream. Martha, the friend in question, took me to Erikson's before I headed home. When we arrived at the window, we must have hovered over the list of flavors for at least ten minutes. The list was extensive and the flavors were tempting. We finally approached the window, even though we were uncommitted. "Mint Ice Cream with Oreos and Cookie Dough." "Hmmm...And purple cow is black raspberry with chocolate chips?" "Vanilla ice cream with fudge swirl and Reese's peanut butter [she used a fancy word here that I can't remember]"
"Can I try the lemon raspberry cheesecake?" "Green Monsta and Almond Joy. If you like coffee Freedom of Espresso is really good." "I don't like coffee. Otherwise I am sure it is good." In the end Martha settled on Moose Tracks and I tried Green Monsta. As per Martha's suggestion, we got kiddie cones. Um, really. Not what you are thinking. Some places would consider this a large and you would have to agree. With the large and generous portions of Erikson's kiddie size, I don't even want to know what the large looked like. This ice cream was amazing. It was rich and creamy and seemed very fresh. Martha commented that the mint balanced the sweetness of the mix-ins well. I loved the huge chunks of oreos. Now that I think of it, I don't particularly recall the cookie dough but I didn't miss it so I think it was a subtle addition that I'd just try to be more aware of next time. And oh, yes. There will be a next time. For both Erikson's and Green Monsta...While Martha enjoyed her cone as well, I think she found hers to be a bit too sweet. Things are rarely too sweet for me -- I had no problem with it. Erikson's isn't just ice cream. It looked like they had hot dogs and things of the like. They also seemed to have an extensive listing of toppings for sundaes. I was tempted to purchase a packed container to take home -- but it was the fifteen or so homemade (by me) flavors in my freezer at home that swayed me. This time. Erikson's has no inside seating area for customers. One orders through one of the three windows while admiring the old photos of the place and noting that the ice cream shop is over seventy years old. (I expect at least another seventy with the quality of their product!) Behind the building there are probably a dozen picnic tables -- some covered by a roof but all shaded. It was almost empty out back and we enjoyed our cones at a table in a calm quiet, beautiful weather and perfect conversation. With the mix of the joy of seeing Martha, the beautiful drive to her house, and the treat of Erikson's, I have a feeling never again will we let four years pass before connecting again.